I love this picture. 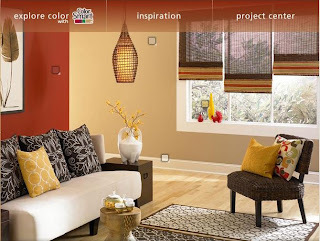 And when I look at it - I can hear my hunny saying to me "Get off the Behr paint website"... LOL.. true its really true! This picture is such my taste, so when I spotted it as an inspiration, I couldn't turn it down. The colors, the clean lines... you name it! 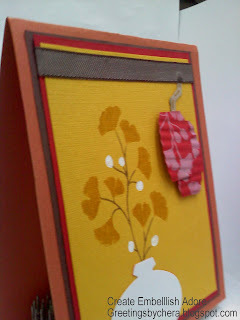 The card base is textured CS in Curry, which I hardly ever touch in my stash. 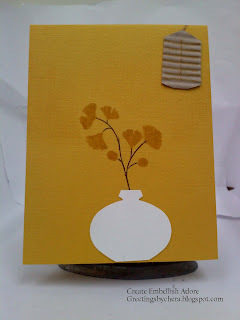 I wanted to recreate the look of the flowers on the table. 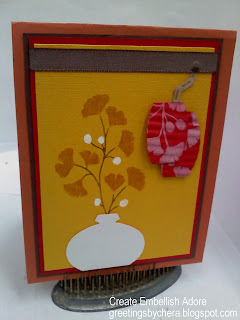 I liked to make a paper lamp.. not sure of it but I will adjust.. WHAT DO YOU THINK? SUGGESTIONS PLEASE??? Altered with some suggestions and I like it! So here is take 2! Thank you for your suggestions! Cute card Chera! Hmm.. if you think it needs something, maybe a little ribbon on the side? Just love your vase and the little "lamp"!! Cute card! Ooohh...I love how you literally interpreted parts of the photo. Nicely done - each of your cards are fabulous Chera!! Thank so much for playing along.